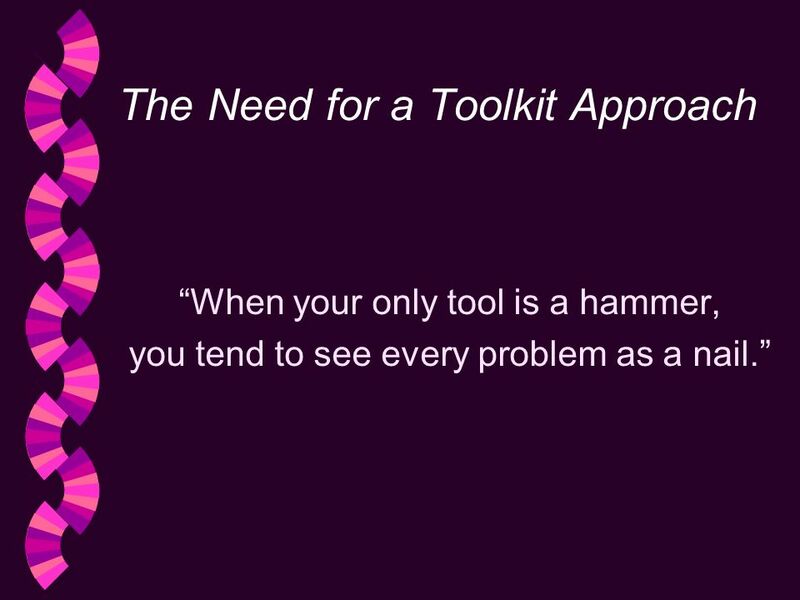 2 The Need for a Toolkit Approach When your only tool is a hammer, you tend to see every problem as a nail. 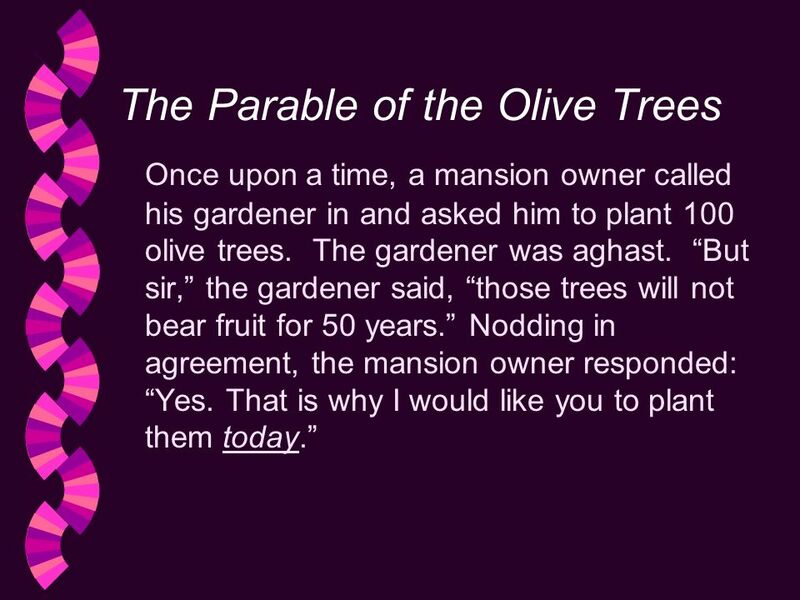 3 The Parable of the Olive Trees Once upon a time, a mansion owner called his gardener in and asked him to plant 100 olive trees. The gardener was aghast. But sir, the gardener said, those trees will not bear fruit for 50 years. Nodding in agreement, the mansion owner responded: Yes. That is why I would like you to plant them today. 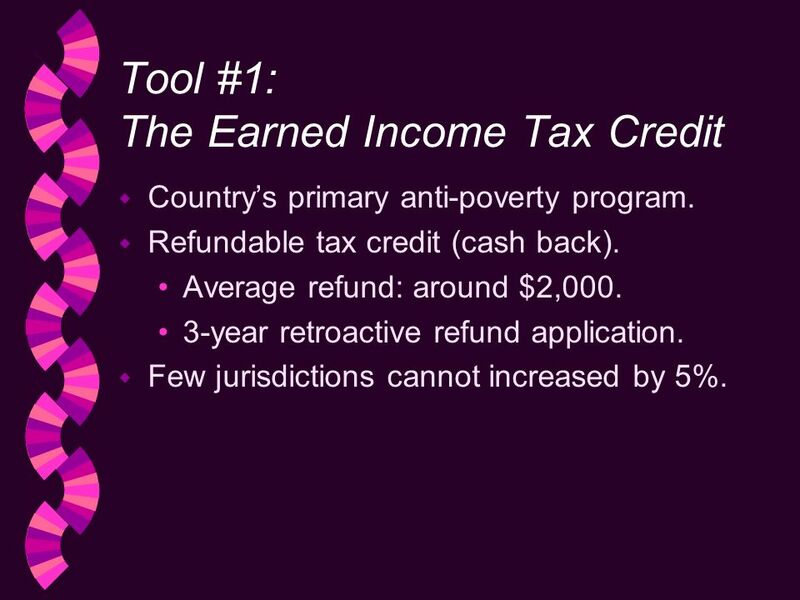 6 Tool #1: The Earned Income Tax Credit w Countrys primary anti-poverty program. 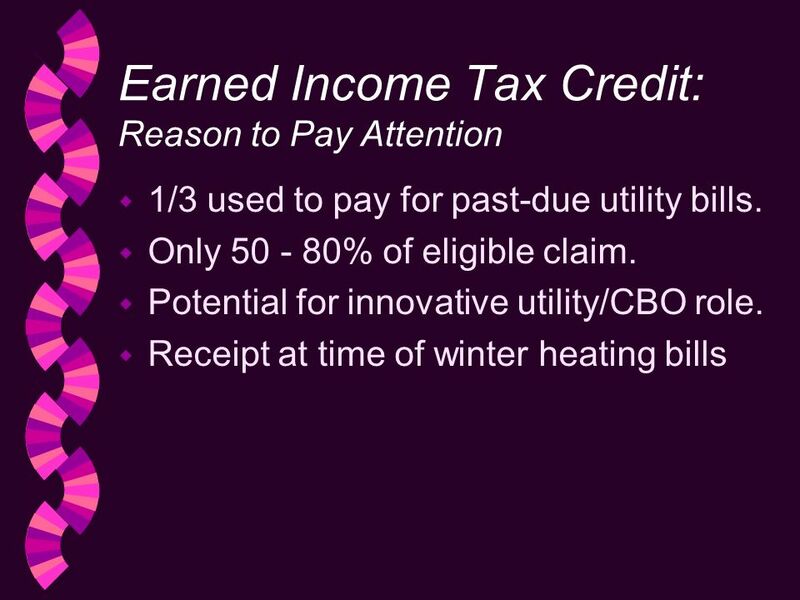 w Refundable tax credit (cash back). Average refund: around $2,000. 3-year retroactive refund application. Few jurisdictions cannot increased by 5%. 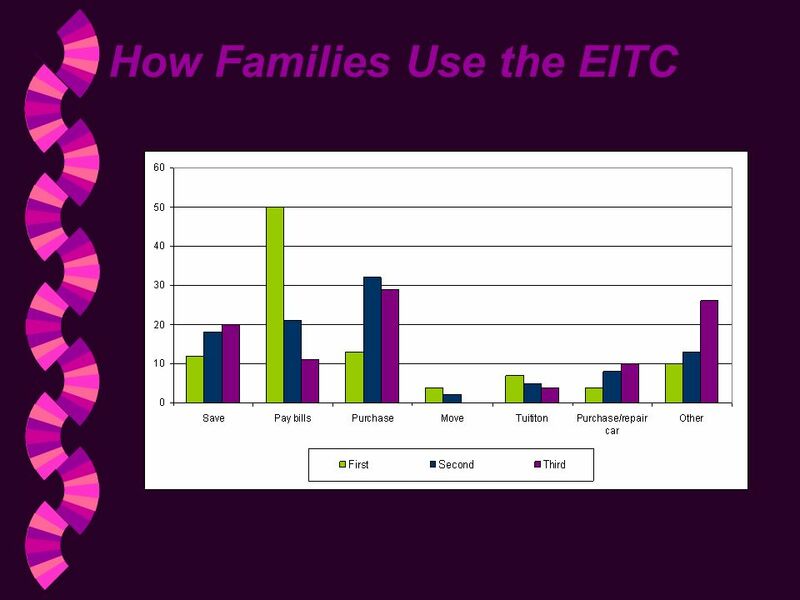 10 Tool #1 (A): Alternatives to Paid Tax Preparers w Low-income households often lose $300 or more of their EITC Pay between $100 and $200 to have their tax returns prepared. Sold refund anticipation loans at a cost of 400% in interest. 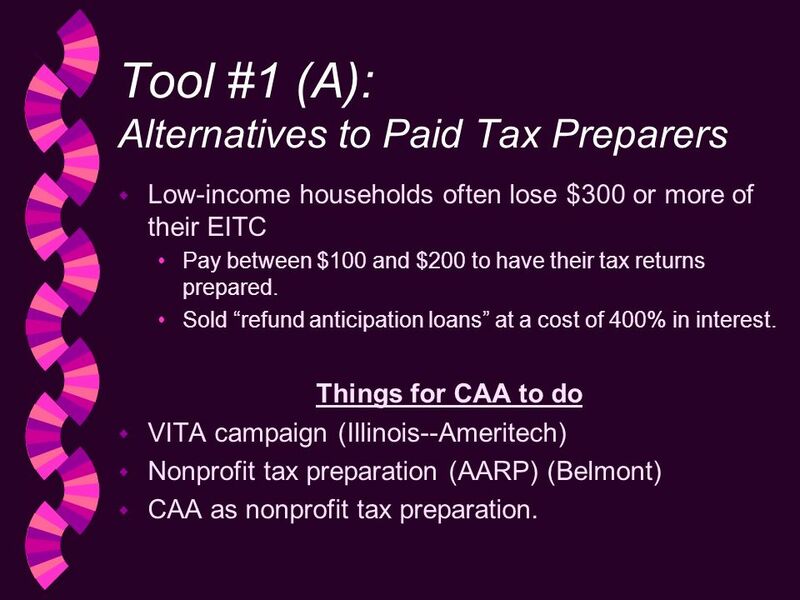 Things for CAA to do w VITA campaign (Illinois--Ameritech) w Nonprofit tax preparation (AARP) (Belmont) w CAA as nonprofit tax preparation. 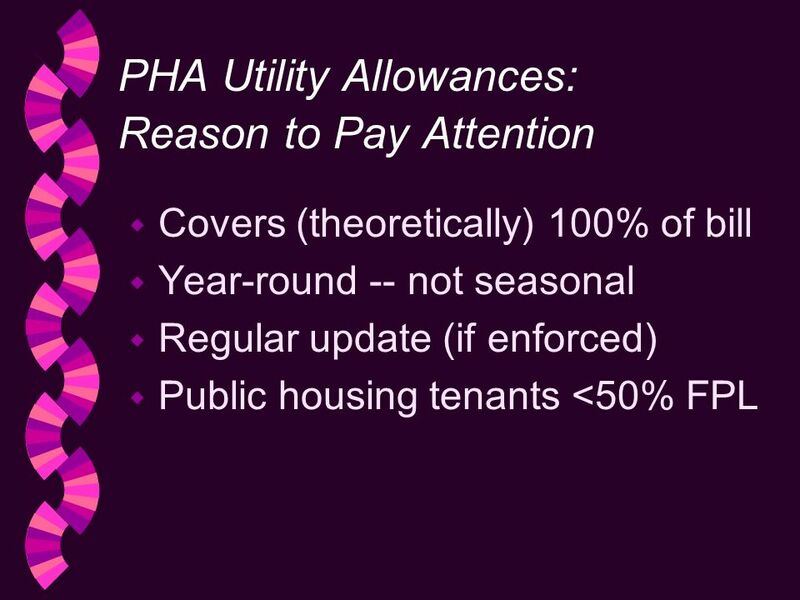 13 PHA Utility Allowances: What Needs to be Done w Review utility allowances to ensure annual update. w Provide notice to PHAs whenever rates change by 10% or more. 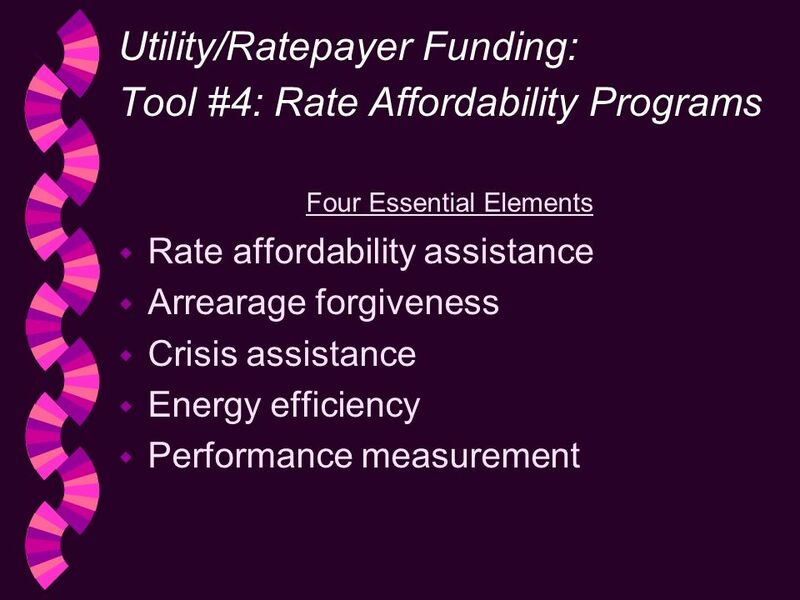 w Review whether utility allowance pays for cooling More advanced advocacy: Review reasonableness of utility allowances Call for help! 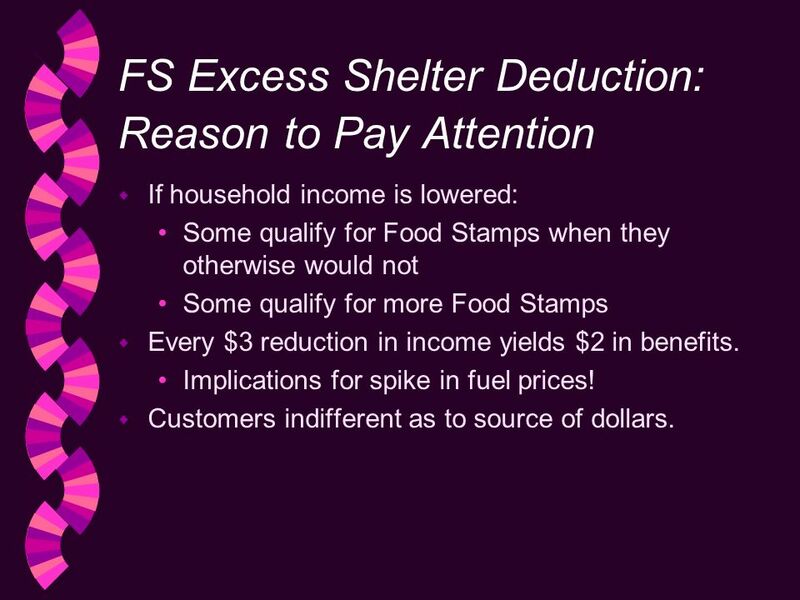 15 FS Excess Shelter Deduction: Reason to Pay Attention w If household income is lowered: Some qualify for Food Stamps when they otherwise would not Some qualify for more Food Stamps w Every $3 reduction in income yields $2 in benefits. Implications for spike in fuel prices! w Customers indifferent as to source of dollars. 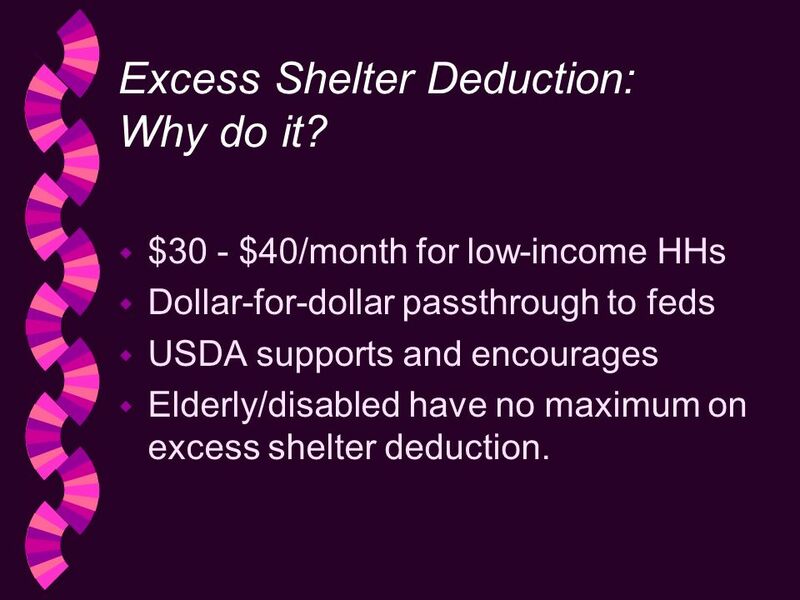 16 Excess Shelter Deduction: Why do it? 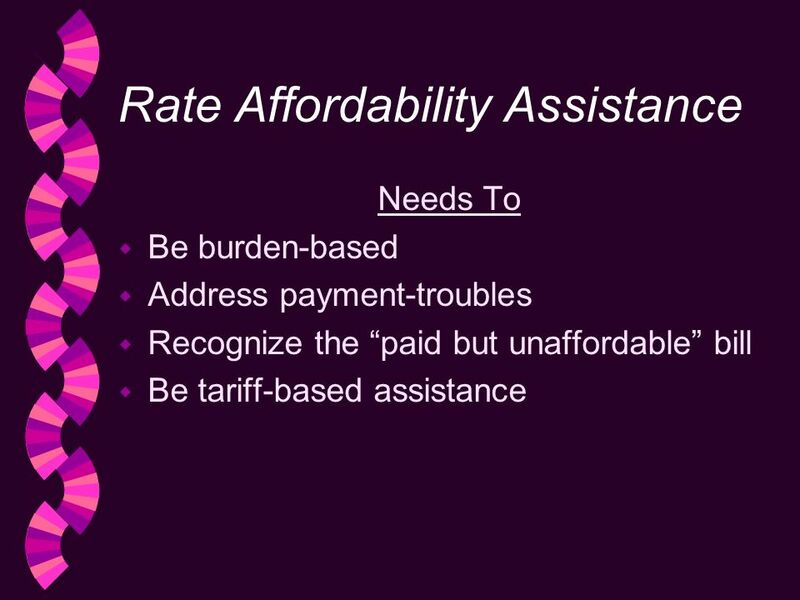 w $30 - $40/month for low-income HHs w Dollar-for-dollar passthrough to feds w USDA supports and encourages w Elderly/disabled have no maximum on excess shelter deduction. 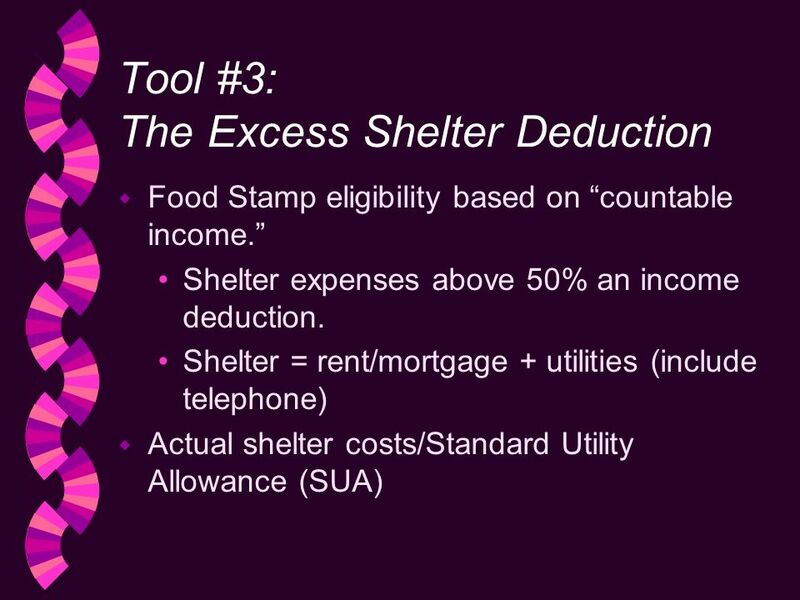 18 The Excess Shelter Deduction: What needs to be done? 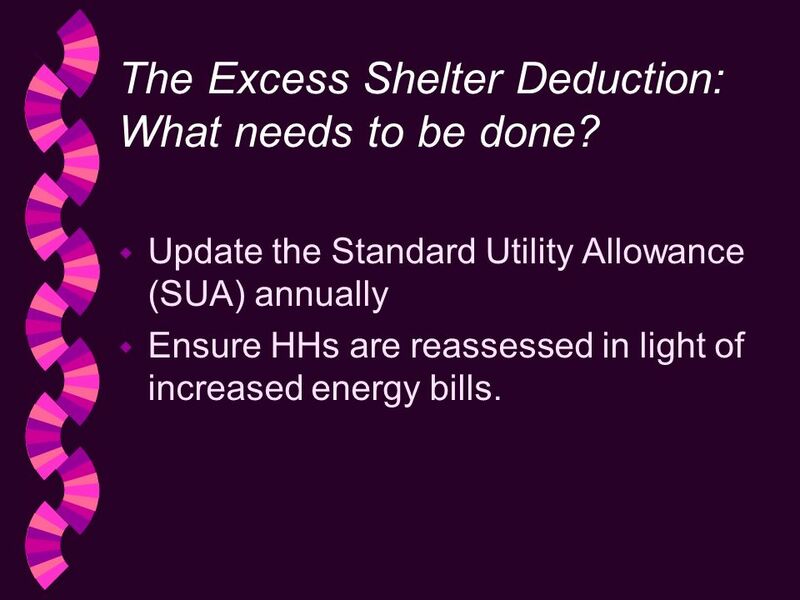 w Update the Standard Utility Allowance (SUA) annually w Ensure HHs are reassessed in light of increased energy bills. 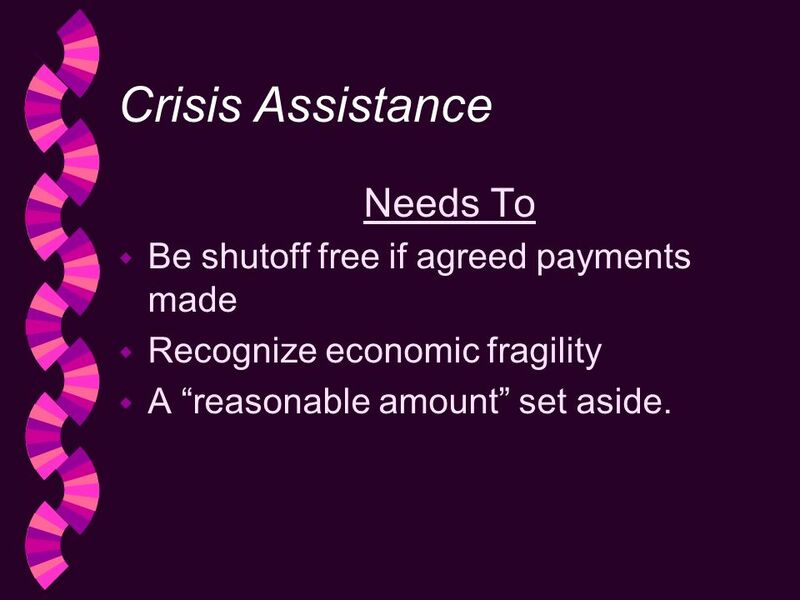 22 Crisis Assistance Needs To w Be shutoff free if agreed payments made w Recognize economic fragility w A reasonable amount set aside. 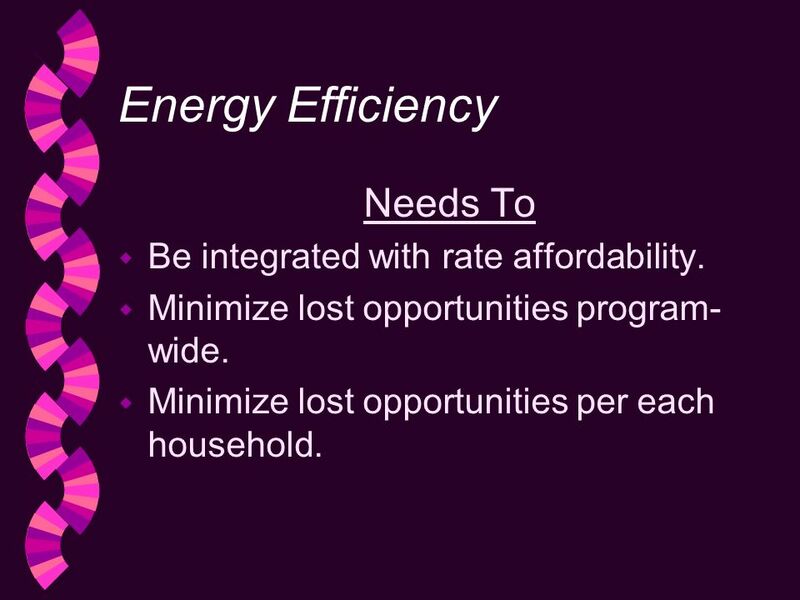 23 Energy Efficiency Needs To w Be integrated with rate affordability. w Minimize lost opportunities program- wide. w Minimize lost opportunities per each household. 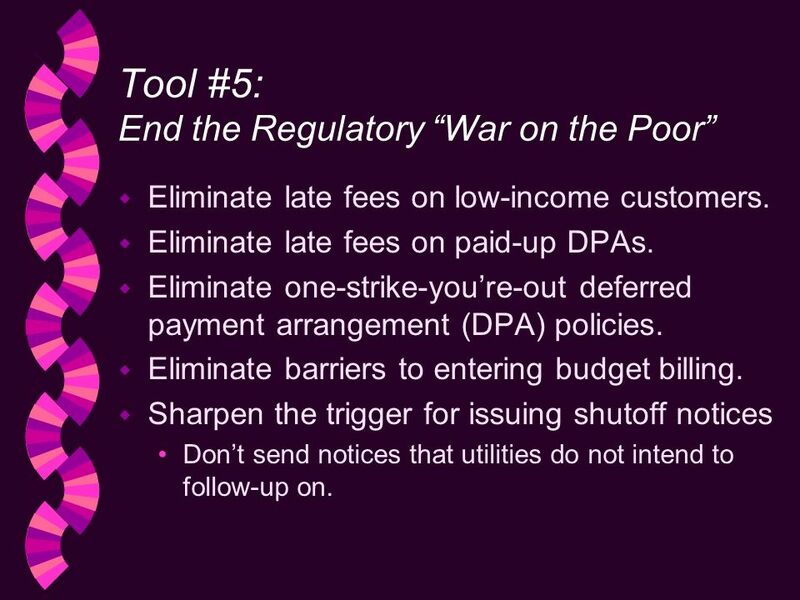 25 Tool #5: End the Regulatory War on the Poor w Eliminate late fees on low-income customers. w Eliminate late fees on paid-up DPAs. w Eliminate one-strike-youre-out deferred payment arrangement (DPA) policies. 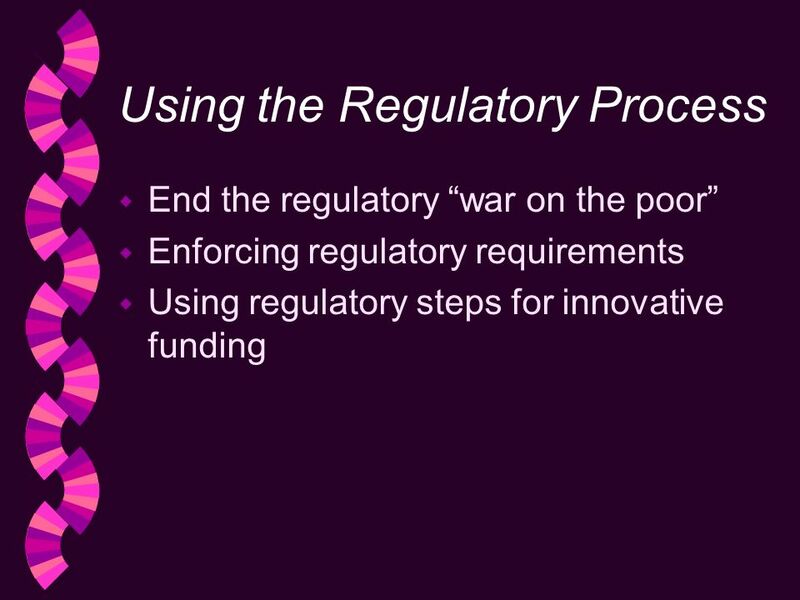 w Eliminate barriers to entering budget billing. w Sharpen the trigger for issuing shutoff notices Dont send notices that utilities do not intend to follow-up on. 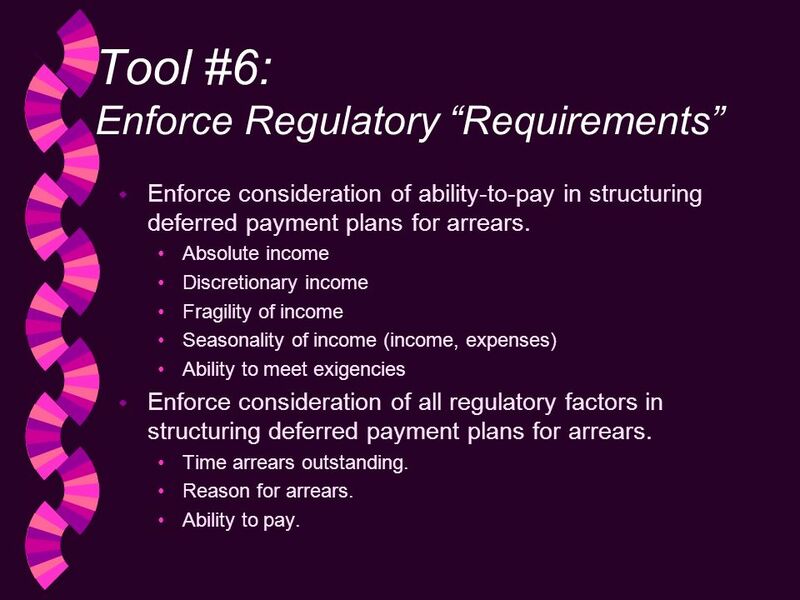 26 Tool #6: Enforce Regulatory Requirements w Enforce consideration of ability-to-pay in structuring deferred payment plans for arrears. Absolute income Discretionary income Fragility of income Seasonality of income (income, expenses) Ability to meet exigencies w Enforce consideration of all regulatory factors in structuring deferred payment plans for arrears. Time arrears outstanding. Reason for arrears. Ability to pay. 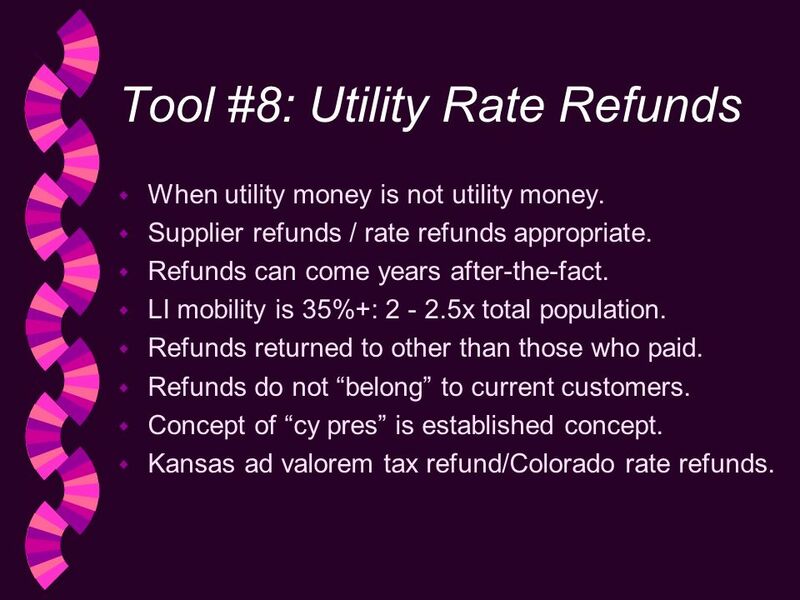 28 Tool #8: Utility Rate Refunds w When utility money is not utility money. w Supplier refunds / rate refunds appropriate. w Refunds can come years after-the-fact. w LI mobility is 35%+: 2 - 2.5x total population. w Refunds returned to other than those who paid. w Refunds do not belong to current customers. w Concept of cy pres is established concept. w Kansas ad valorem tax refund/Colorado rate refunds. 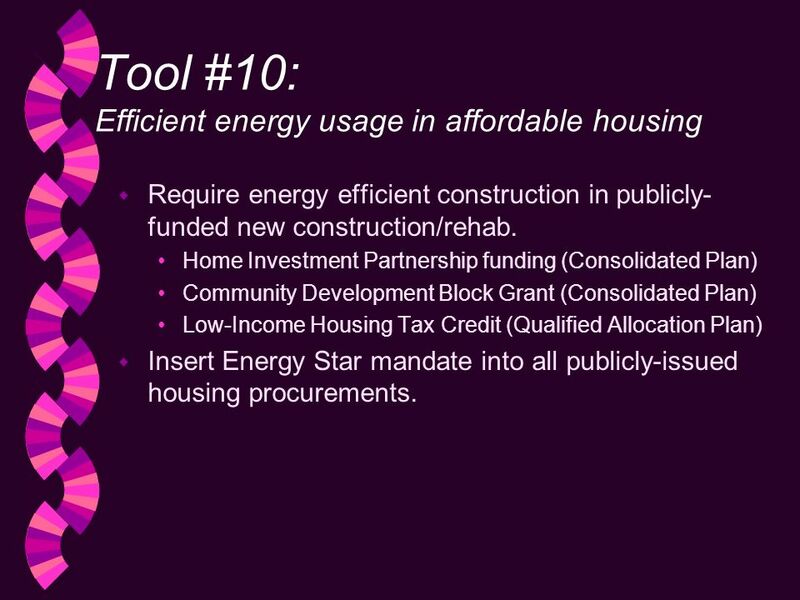 32 Tool #10: Efficient energy usage in affordable housing w Require energy efficient construction in publicly- funded new construction/rehab. 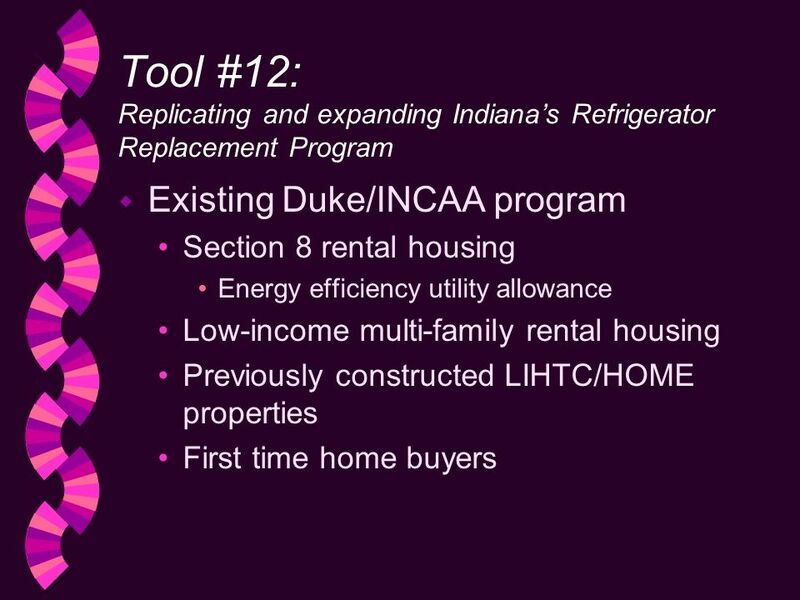 Home Investment Partnership funding (Consolidated Plan) Community Development Block Grant (Consolidated Plan) Low-Income Housing Tax Credit (Qualified Allocation Plan) w Insert Energy Star mandate into all publicly-issued housing procurements. 33 Energy Star building: Why doesnt everyone do it? 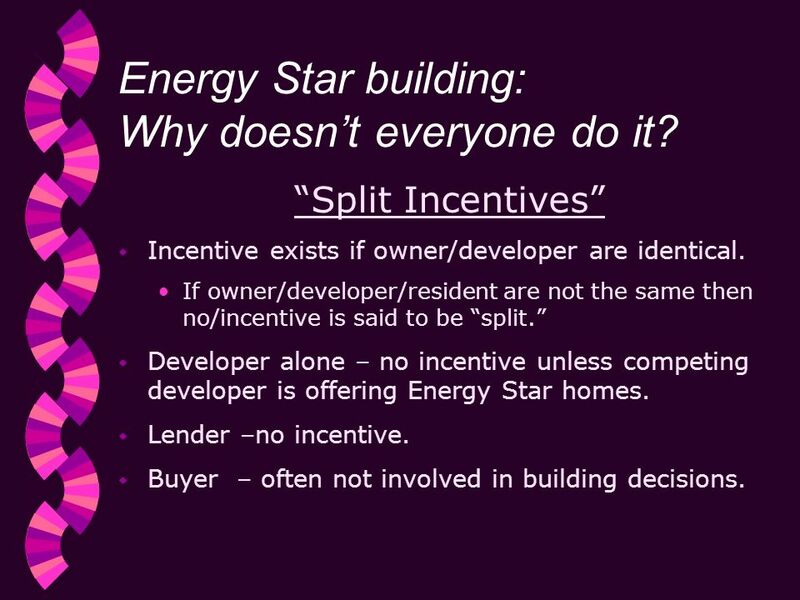 Split Incentives w Incentive exists if owner/developer are identical. If owner/developer/resident are not the same then no/incentive is said to be split. w Developer alone – no incentive unless competing developer is offering Energy Star homes. w Lender –no incentive. w Buyer – often not involved in building decisions. 34 Energy Star in Affordable Housing What needs to be done w Insert Energy Star into RFP/specifications for affordable housing. 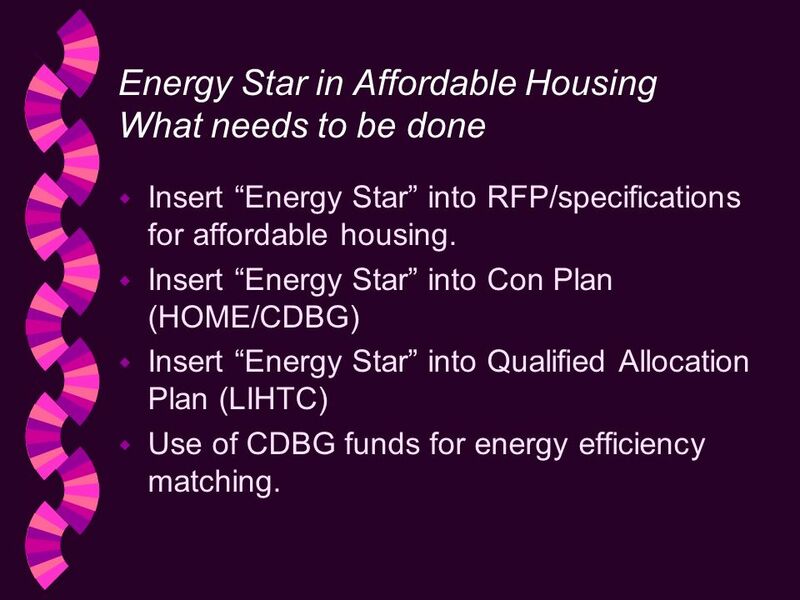 w Insert Energy Star into Con Plan (HOME/CDBG) w Insert Energy Star into Qualified Allocation Plan (LIHTC) w Use of CDBG funds for energy efficiency matching. 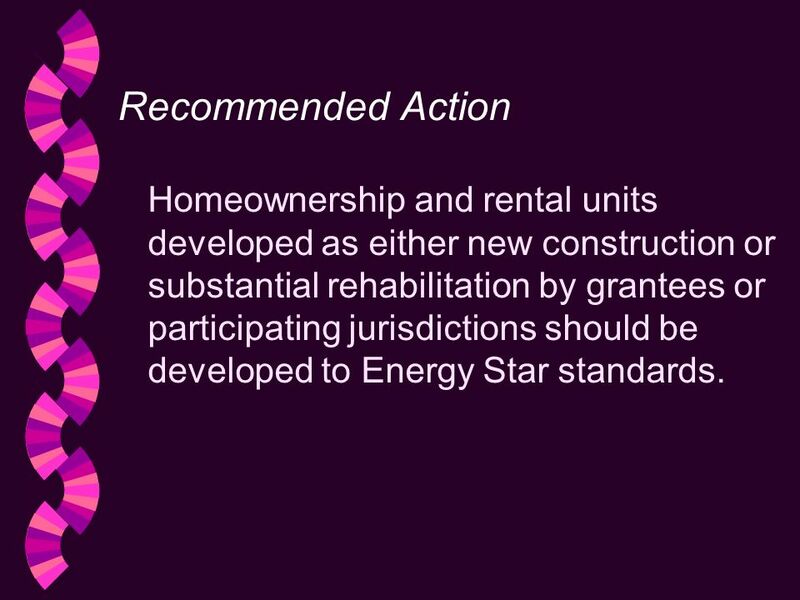 35 Recommended Action Homeownership and rental units developed as either new construction or substantial rehabilitation by grantees or participating jurisdictions should be developed to Energy Star standards. 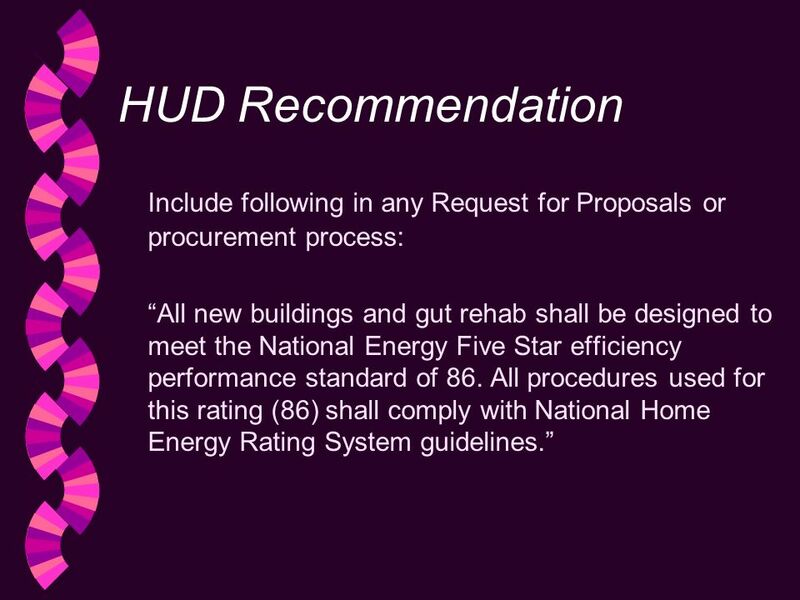 36 HUD Recommendation Include following in any Request for Proposals or procurement process: All new buildings and gut rehab shall be designed to meet the National Energy Five Star efficiency performance standard of 86. All procedures used for this rating (86) shall comply with National Home Energy Rating System guidelines. 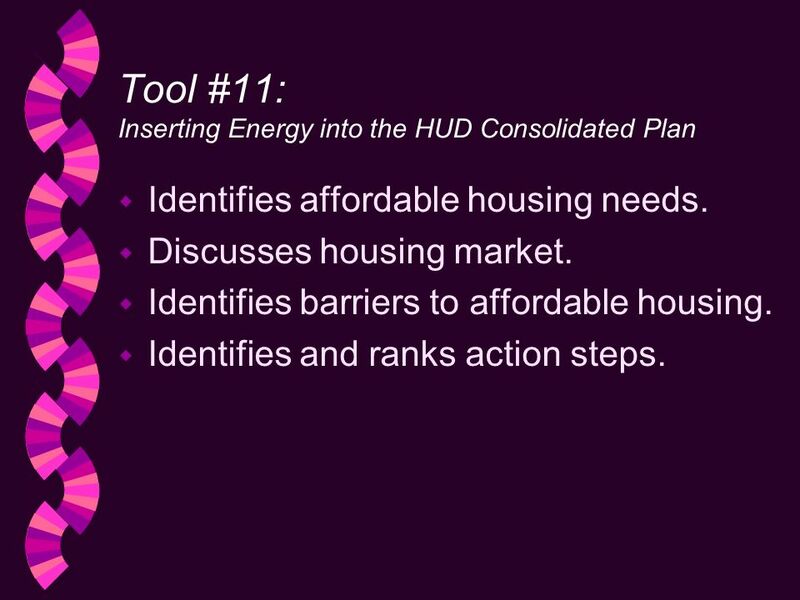 37 Tool #11: Inserting Energy into the HUD Consolidated Plan w Identifies affordable housing needs. w Discusses housing market. w Identifies barriers to affordable housing. w Identifies and ranks action steps. 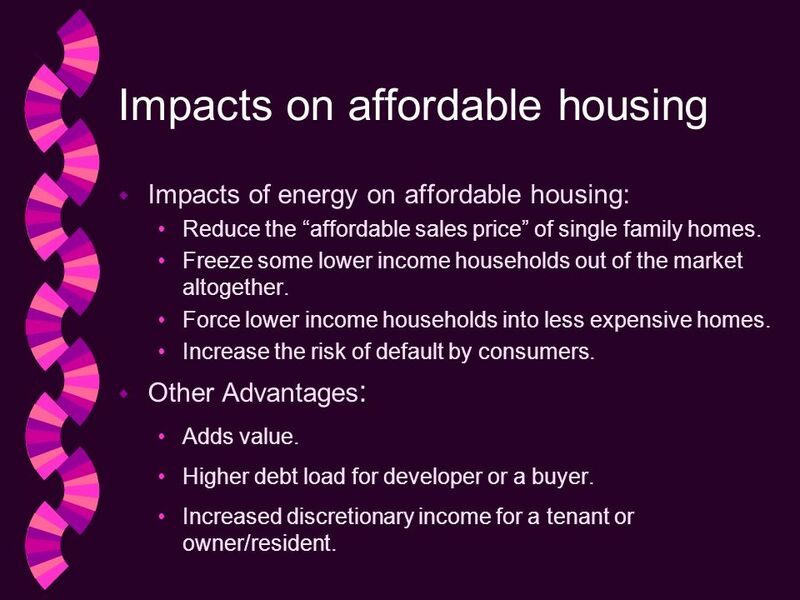 38 Impacts on affordable housing w Impacts of energy on affordable housing: Reduce the affordable sales price of single family homes. Freeze some lower income households out of the market altogether. Force lower income households into less expensive homes. Increase the risk of default by consumers. : w Other Advantages : Adds value. Higher debt load for developer or a buyer. Increased discretionary income for a tenant or owner/resident. 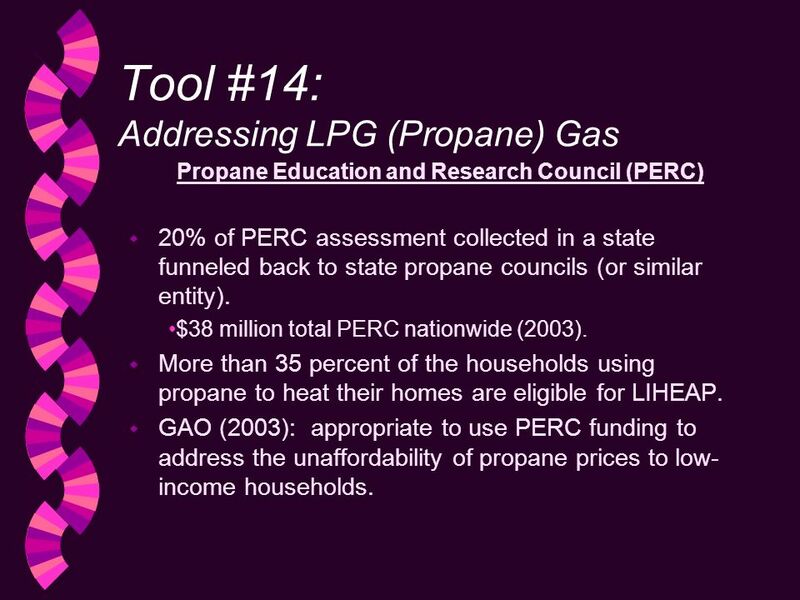 41 Tool #14: Addressing LPG (Propane) Gas Propane Education and Research Council (PERC) w 20% of PERC assessment collected in a state funneled back to state propane councils (or similar entity). $38 million total PERC nationwide (2003). w More than 35 percent of the households using propane to heat their homes are eligible for LIHEAP. 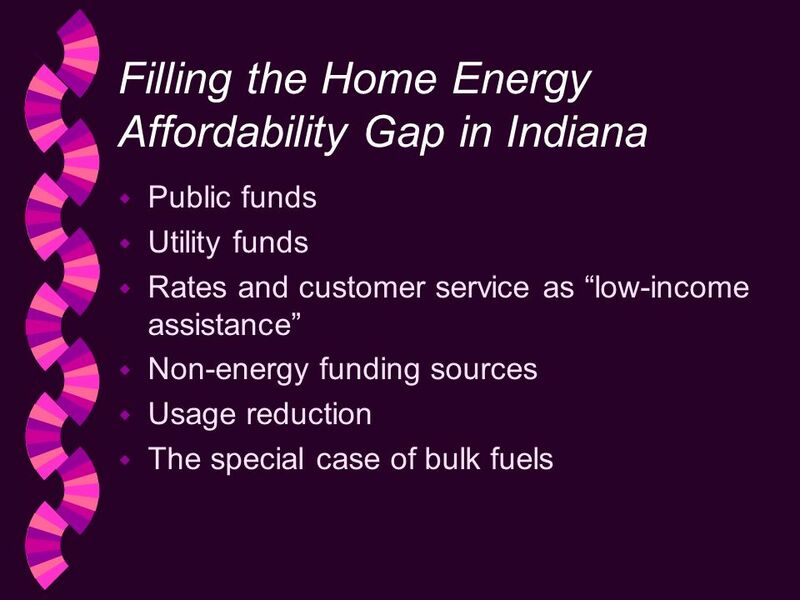 w GAO (2003): appropriate to use PERC funding to address the unaffordability of propane prices to low- income households. 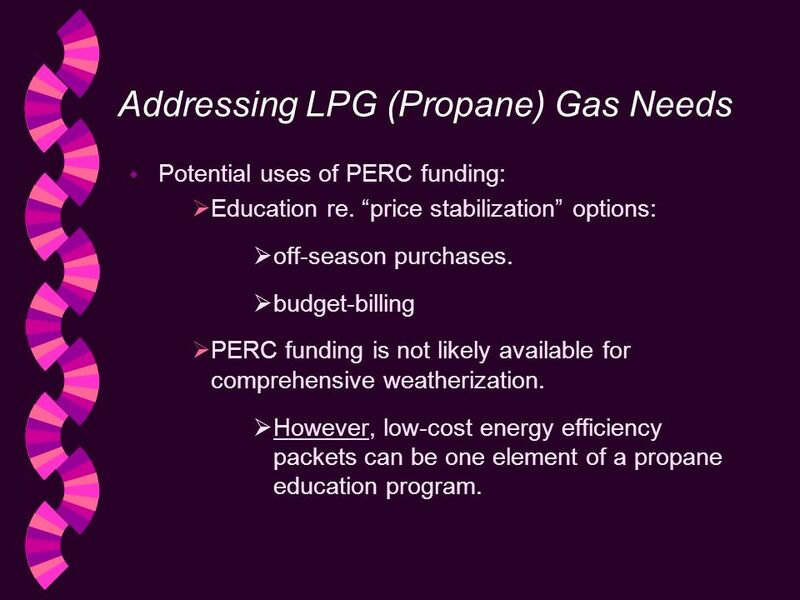 42 Addressing LPG (Propane) Gas Needs w Potential uses of PERC funding: Education re. price stabilization options: off-season purchases. 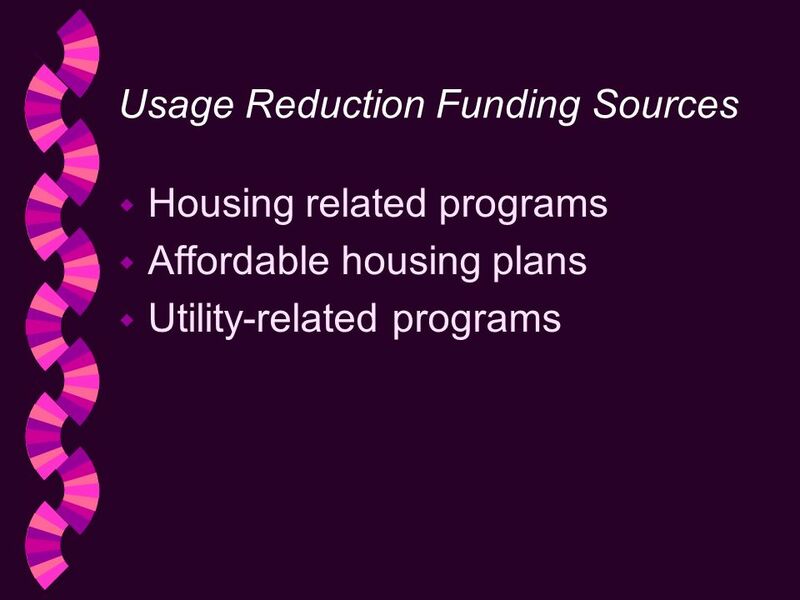 budget-billing PERC funding is not likely available for comprehensive weatherization. 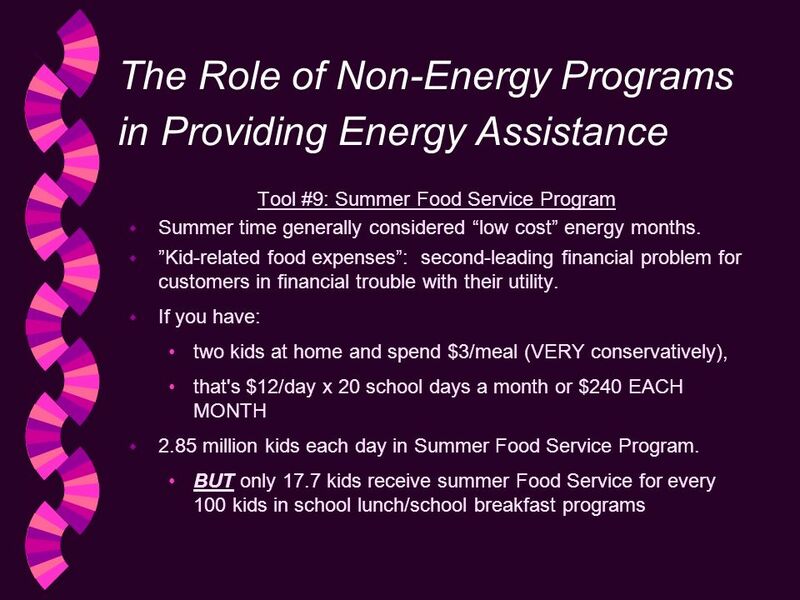 However, low-cost energy efficiency packets can be one element of a propane education program. 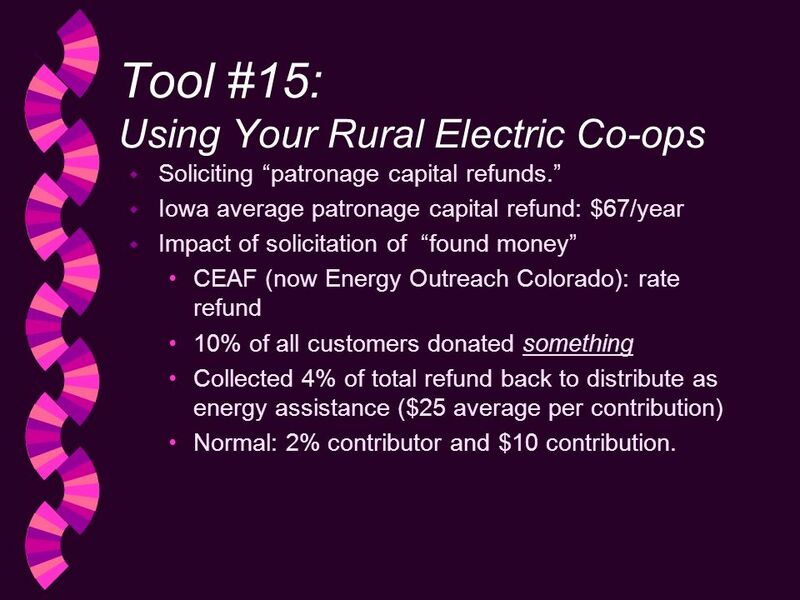 43 Tool #15: Using Your Rural Electric Co-ops w Soliciting patronage capital refunds. w Iowa average patronage capital refund: $67/year w Impact of solicitation of found money CEAF (now Energy Outreach Colorado): rate refund 10% of all customers donated something Collected 4% of total refund back to distribute as energy assistance ($25 average per contribution) Normal: 2% contributor and $10 contribution. 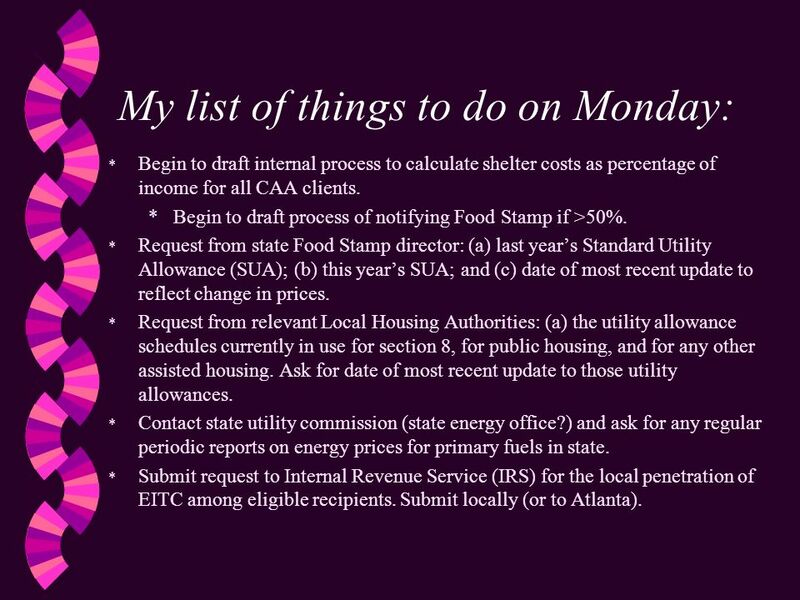 46 My list of things to do on Monday: * Begin to draft internal process to calculate shelter costs as percentage of income for all CAA clients. *Begin to draft process of notifying Food Stamp if >50%. 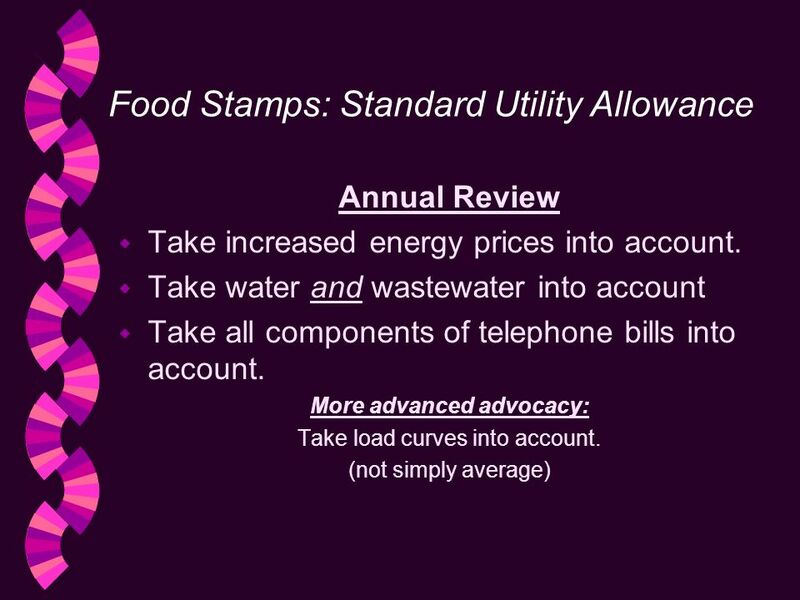 * Request from state Food Stamp director: (a) last years Standard Utility Allowance (SUA); (b) this years SUA; and (c) date of most recent update to reflect change in prices. 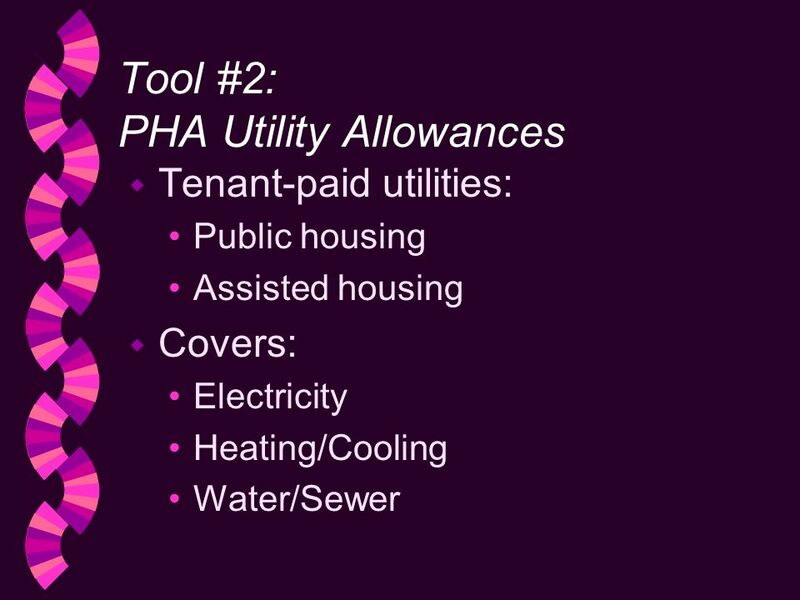 * Request from relevant Local Housing Authorities: (a) the utility allowance schedules currently in use for section 8, for public housing, and for any other assisted housing. 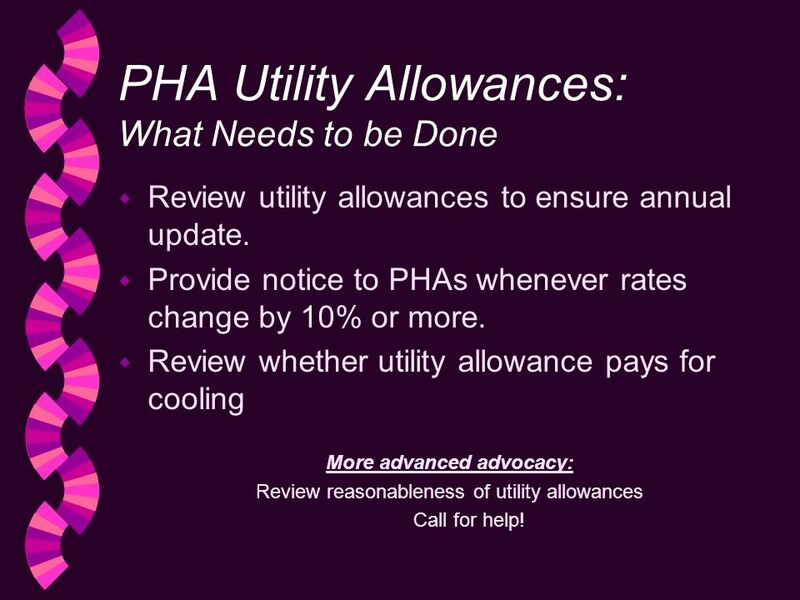 Ask for date of most recent update to those utility allowances. * Contact state utility commission (state energy office?) and ask for any regular periodic reports on energy prices for primary fuels in state. * Submit request to Internal Revenue Service (IRS) for the local penetration of EITC among eligible recipients. Submit locally (or to Atlanta). 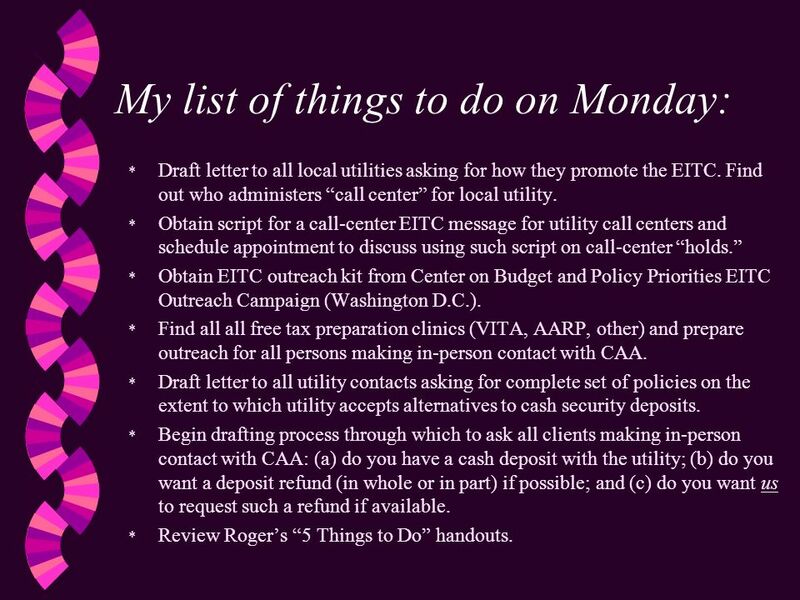 47 My list of things to do on Monday: * Draft letter to all local utilities asking for how they promote the EITC. Find out who administers call center for local utility. * Obtain script for a call-center EITC message for utility call centers and schedule appointment to discuss using such script on call-center holds. 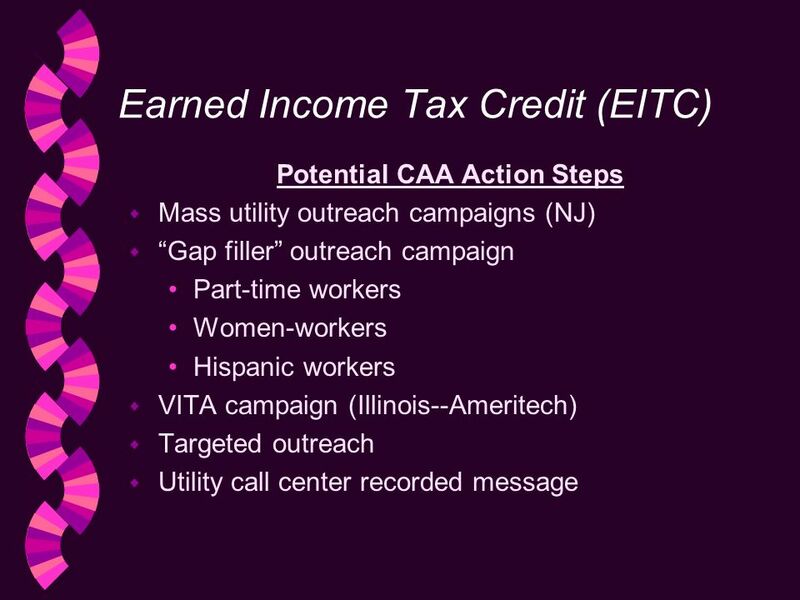 * Obtain EITC outreach kit from Center on Budget and Policy Priorities EITC Outreach Campaign (Washington D.C.). * Find all all free tax preparation clinics (VITA, AARP, other) and prepare outreach for all persons making in-person contact with CAA. 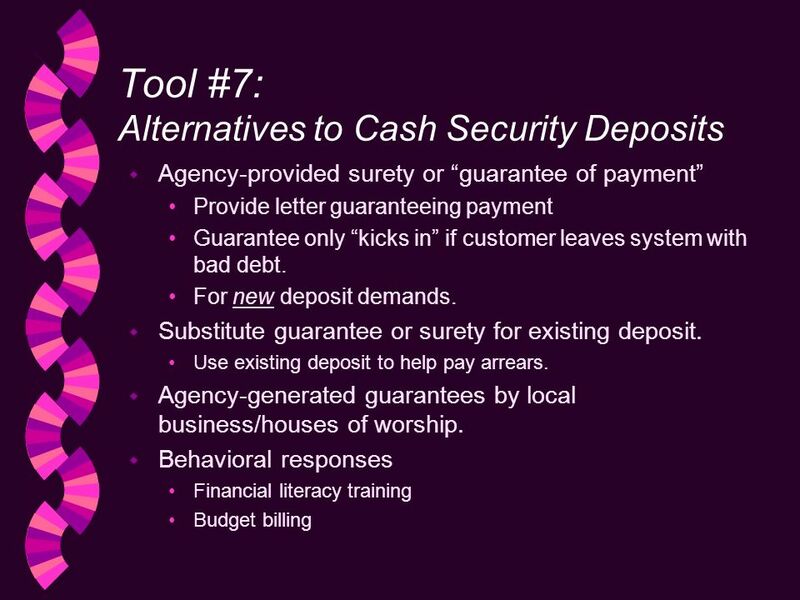 * Draft letter to all utility contacts asking for complete set of policies on the extent to which utility accepts alternatives to cash security deposits. * Begin drafting process through which to ask all clients making in-person contact with CAA: (a) do you have a cash deposit with the utility; (b) do you want a deposit refund (in whole or in part) if possible; and (c) do you want us to request such a refund if available. * Review Rogers 5 Things to Do handouts. 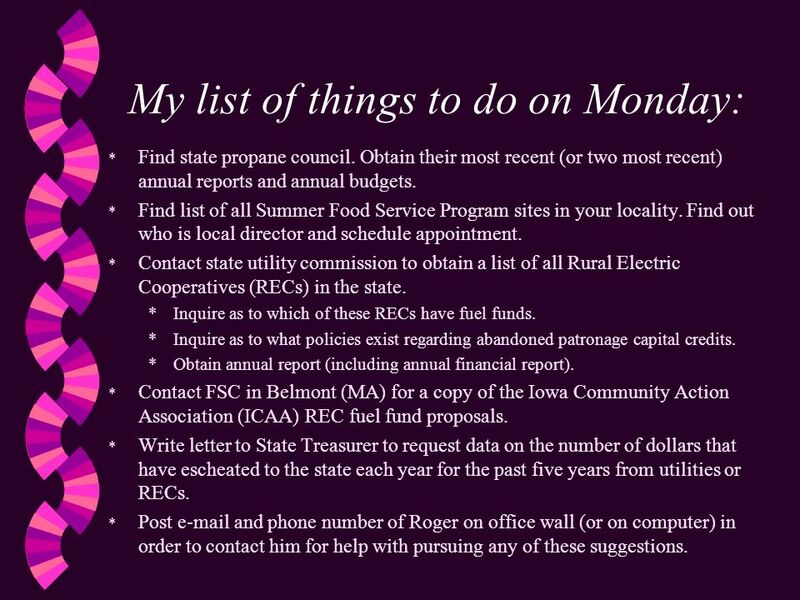 48 My list of things to do on Monday: * Find state propane council. Obtain their most recent (or two most recent) annual reports and annual budgets. 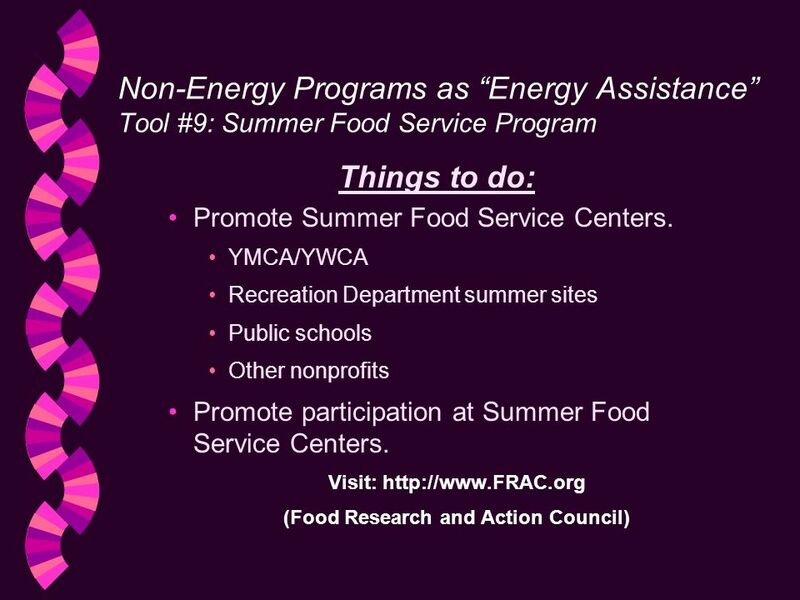 * Find list of all Summer Food Service Program sites in your locality. Find out who is local director and schedule appointment. * Contact state utility commission to obtain a list of all Rural Electric Cooperatives (RECs) in the state. *Inquire as to which of these RECs have fuel funds. *Inquire as to what policies exist regarding abandoned patronage capital credits. *Obtain annual report (including annual financial report). 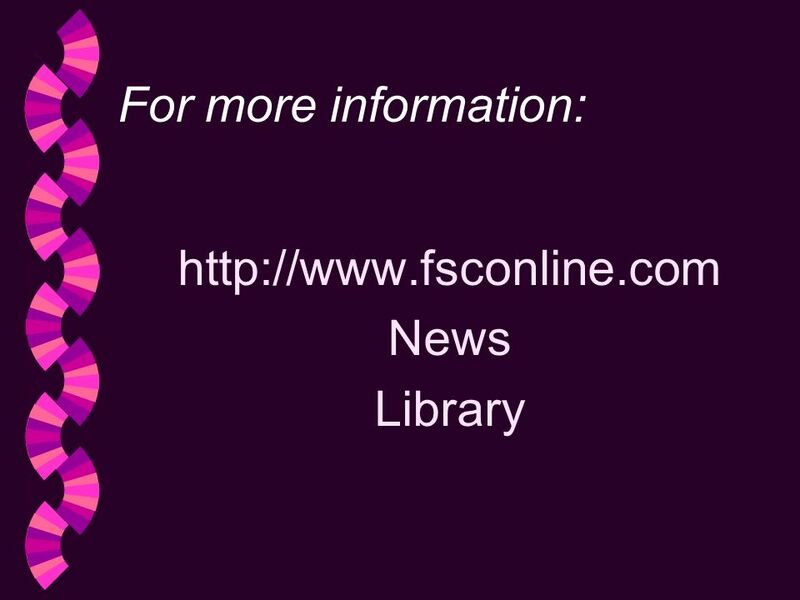 * Contact FSC in Belmont (MA) for a copy of the Iowa Community Action Association (ICAA) REC fuel fund proposals. * Write letter to State Treasurer to request data on the number of dollars that have escheated to the state each year for the past five years from utilities or RECs. 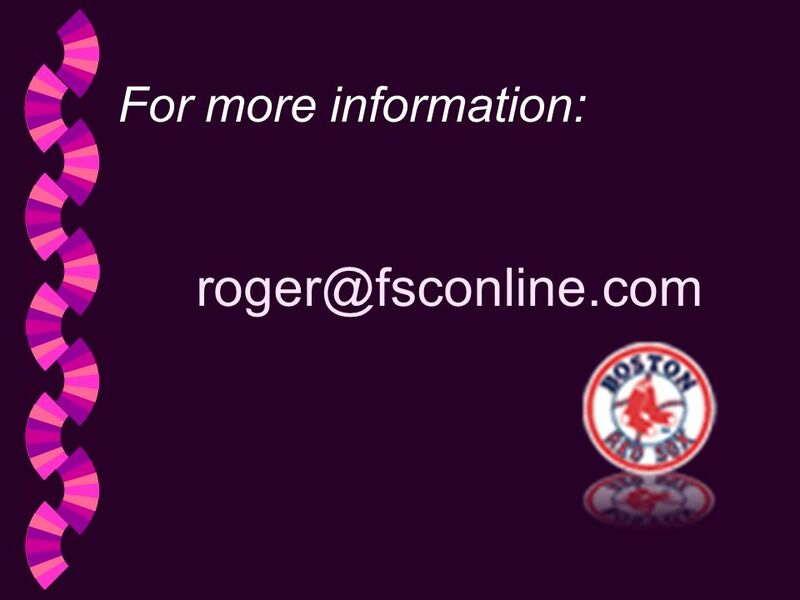 * Post e-mail and phone number of Roger on office wall (or on computer) in order to contact him for help with pursuing any of these suggestions. 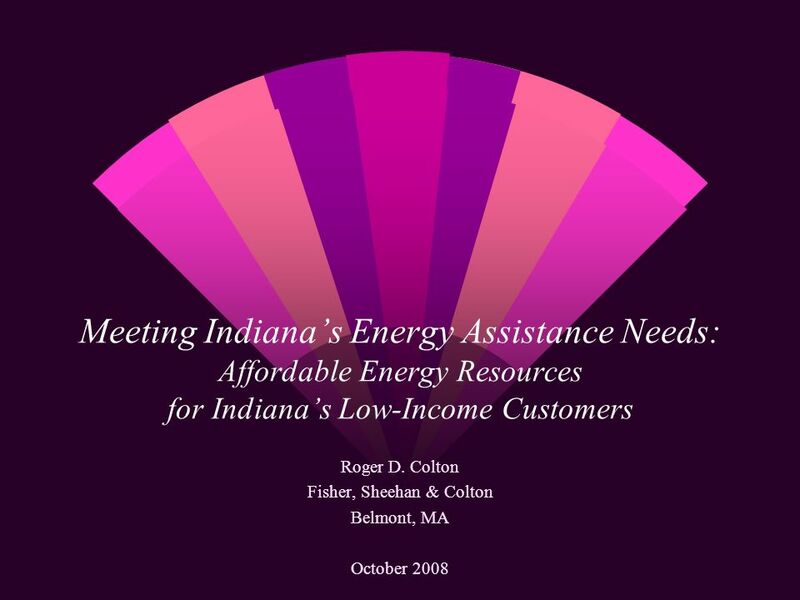 Download ppt "Meeting Indianas Energy Assistance Needs: Affordable Energy Resources for Indianas Low-Income Customers Roger D. Colton Fisher, Sheehan & Colton Belmont,"
The Home Energy Affordability Gap: Putting Data to Work Roger D. Colton Fisher, Sheehan & Colton National Fuel Funds Network June 2003. Home Energy Ratings in Delaware Roger Colton Fisher, Sheehan & Colton February 1999. Jeopardy Filing StatusDependentsIncome Deductions & Credits Q $100 Q $200 Q $300 Q $400 Q $500 Q $100 Q $200 Q $300 Q $400 Q $500 Final Jeopardy Miscellaneous. 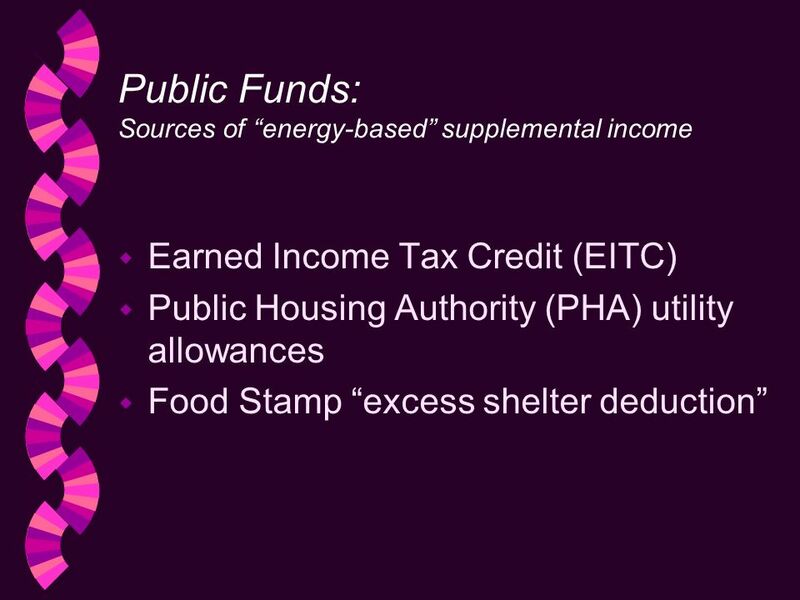 Utility Costs and the Food Stamp Program: Implementing the Excess Shelter Deduction Roger D. Colton Fisher, Sheehan & Colton Public Finance and General. The Consequences of Energy Poverty: And What you Can Do About It Roger Colton Fisher, Sheehan & Colton Public Finance and General Economics Belmont, MA. Bridging the Gaps: Structuring Benefits to Promote Mobility for Low Wage Workers A collaboration of the Center for Social Policy, University of Massachusetts. Michigan DHS Earned Income Tax Credit Demonstration Project Year Two October – May, 2009. 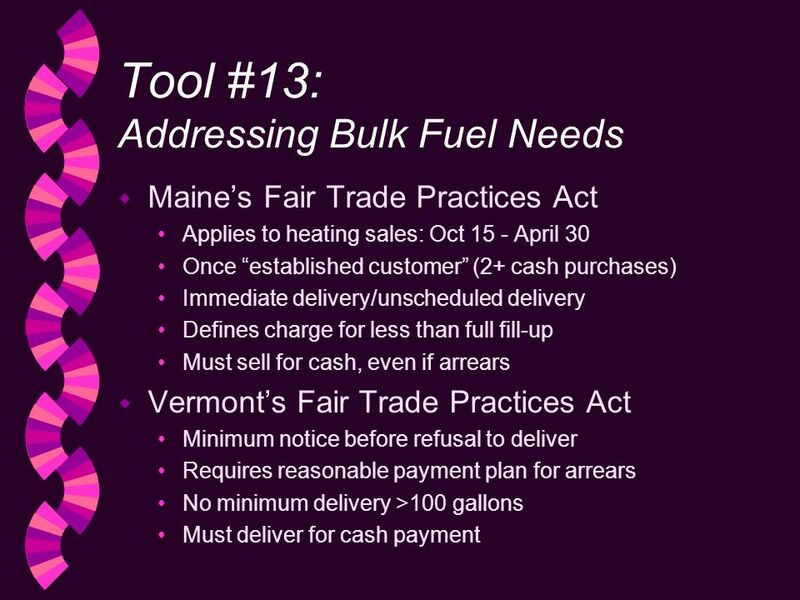 Integrating Government-Funded & Ratepayer-Funded Fuel Assistance Programs Roger D. Colton Fisher, Sheehan & Colton Public Finance and General Economics. Nebraska Energy Burden Study 2013 Update The Second Annual Nebraska-Western Iowa Symposium on Homelessness August 7, 2013 Kearney, NE Jerry Deichert Center. Module 3 - Earned Income Tax Credit and Free Tax Preparation Assistance Introduction Asset Development Strategies for Persons with Disabilities.